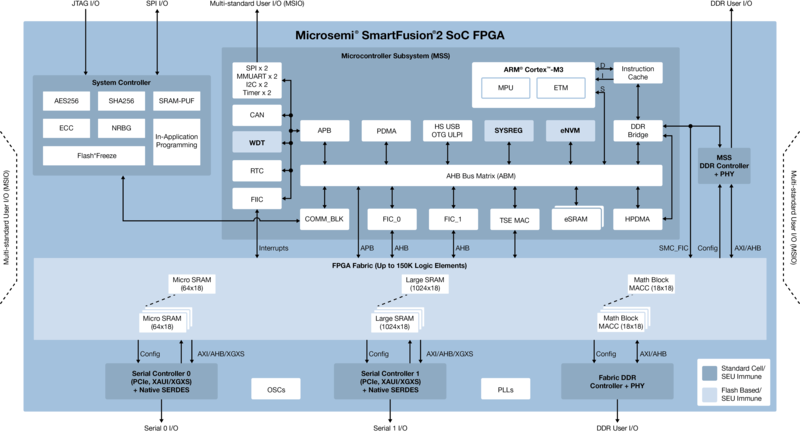 SmartFusion2 SoC FPGA is distinguished by containing an embedded Non-Volatile-Memory (eNVM) that is used to store the code needed for the booting process of the FPGA after power up. So in the presence of this Flash memory why do we still need the eSRAM ? eNVM is nonvolatile and has a limited number of write cycles. A typical application needs both kinds of memory. eSRAM is likely a lot faster, and as it is SRAM it can be written an unlimited number of times. Think of the eNVM as the hard drive/SSD and the eSRAM as the RAM. Not the answer you're looking for? Browse other questions tagged fpga memory sram non-volatile-memory microsemi-fpga or ask your own question. What are the “embedded” and “non-embedded” design flows? Why do most of the non-volatile memories have logical 1 as the default state? There is Hardware, Software, Firmware and …FPGAware? What makes Smartfusion2 FPGA clamed as highly secure to ensure secure booting? Why are SRAM based FPGA used more than NVM based FPGA?